Ahhhh. Did you think bartenders had run out of -"tini's"? If so, you would be WRONG. We haven't personally tried this week's chocolate-laden concoction (we WILL this weekend), but those who have say it's simple divine. Maybe that's why it's called the Divinitini. 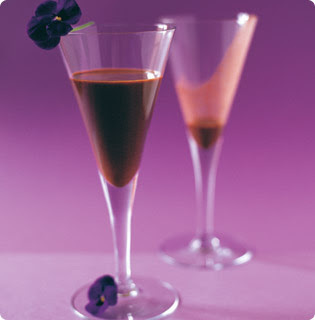 Put the melted chocolate, orange vodka, pure vodka, Grand Marnier, Crème de Cocoa into a cocktail shaker. Crush the orange slice and add. Shake well and then pour into a chilled glass, decorated with a pansy on the side, and sip. I recently had a cheesecake martini at a restaurant called lobster box in city island.. Low alcohol content but may I say.. DIVINE!